Once you have finished writing your manuscript you need to select a journal to publish it in. Journal selection is very important. Try to select a good quality, peer-reviewed journal that is relevant in your field, as your publication list will have a great effect on your career. Start with selecting several journals. If you are looking for suggestions you can have a look at this website that can make suggestions based on your abstract or keywords: http://jane.biosemantics.org/ JANE, which stands for Journal/Author Name Estimator, compares the keywords or words in your abstract to the millions of publications in PubMed. JANE can thus come up with journal names if you are looking for a journal to submit to. Depending on the search criteria you tick, JANE can also come up with articles on the same subject if you are still in the writing process, or with author names if you need to suggest potential reviewers of your manuscript. You can find similar journal selection tools that are specific for Elsevier journals at https://journalfinder.elsevier.com/ (>2200 titles) and for Springer journals at https://journalsuggester.springer.com/ (>2500 titles). Does the journal fit with your manuscript? Once you selected several potential journals carefully check whether the subject of your manuscript matches the scope of the journal. Next check whether the type of manuscript you wrote (case report, research article, review, etc) is accepted by the journal. The quality of the journal (reflected partly in the impact factor) is important for your career, reputation, and chances of obtaining funding. So make sure the journal is peer-reviewed and that it is indexed in PubMed (or the publication database that is relevant in your field). Articles that are not indexed in the important publication database of your field will not be found and read by your target audience, and will not get cited. You also need to make sure that the journal is not a predatory journal. You can find information on the scientific ranking of journals at SJR. Depending on your budget you may want to look up whether you need to pay a publication fee. And if so, whether your institution or funding agency will pay for it. You can ask your librarian, they usually know. Publication fees are sometimes waived or reduced if you are from a low-income country. Alternatively, you may be able to get a reduction if one of the authors is a member of some society, is an editor, or has reviewed for that journal. Publication fees easily go up to $1000 and more so it is worth asking around. If your topic is very hot, or if you are in a hurry because you need to get your manuscript published, or at least accepted for publication, before the next grant round or some other important event (thesis defense, job applications) you may want to have a careful look at publication turnaround time. Some journals are very fast and others are very slow, with the fast ones taking about two months, and the slower ones taking half a year or more. To figure out turnaround time look up a few articles and compare the date of submission with the online publication date or look at my blog on publication turnaround time for sites where you can find this information. If there are multiple journals that are equally suitable for your manuscript you can rank them based on relevancy, impact factor, publication cost, or turnaround time. Once you selected the journal to submit to you should keep your list of potential journals with your notes on their characteristics, so you do not have to go through the selection process again if your manuscript is rejected. The majority of manuscripts get rejected by journals upon first submission and it is therefore not uncommon to have to submit to two or more journals before your article is accepted. If you choose the journal well you reduce the chance of rejection. 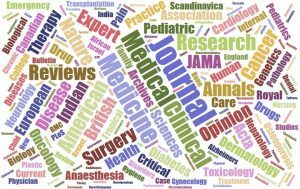 Journal selection: how do you choose from the thousands of available journals?